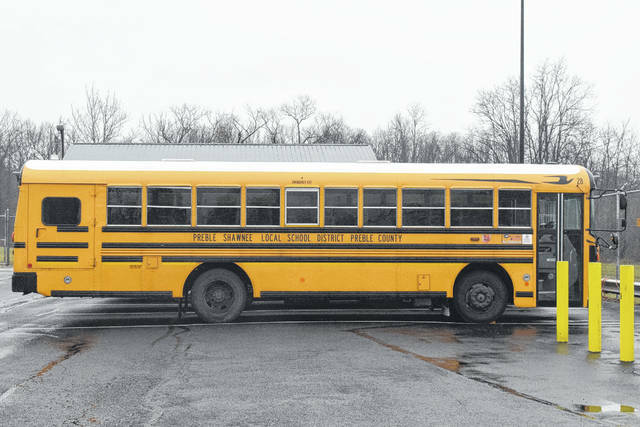 CAMDEN — Preble Shawnee has been on a 2-1 cycle of purchasing new buses, in the hopes of having an updated fleet within six years. According to Superintendent Matt Bishop, this school year was supposed to be a year Preble Shawnee purchased two buses. However, in fear of their “general fund dwindling” they held off on purchasing two buses and only got one new one this year. Now, community members are worried over the safety of the fleet. During the board of education meeting on Thursday, Feb. 22, concerned citizen (and husband to a Preble Shawnee bus driver) Andy Groh addressed the board on what he considers to be a major safety hazard. “I’m here on behalf of the safety of getting the kids to school safety by the school buses. I do not not know if the board is aware of the issues going on with the buses or not, but we have over 13 buses with over 200,000, a total of 23 buses in all. Four of the 13 have over 300,000 miles on them,” Groh said. “There are certain buses in the fleet that the mechanic has put black tape over their safety lights. That is a pretty big risk if something happens standard wise, so you guys need to look into that. The school would be liable. The other thing is two weeks ago they ran out of sub buses. One lady was told to drive her bus, even though it wasn’t safe, because all the sub buses were broke down. We’re getting into big issues here with kids and driver safety. Bishop asked what bus it was, or who the driver was, and Groh responded it is the bus his wife drives. Groh then aired some of his grievances with the district’s mechanic, whom he feels should come in before the bus drivers or stay after the bus drivers. “I would like to see the board create a plan for new buses and stick to it,” Groh said. However, at press time, Superintendent Bishop said not all the numbers Groh shared were correct. The figures Groh brought in front of the board showed there are a total of 23 buses and 13 of them have more than 200,000 miles on them, with four of those 13 having more than 300,000 miles on them. According to Bishop, there are a total of 23 buses in the fleet and 10 have more than 200,000 miles on them, with two having more than 300,000 miles. He added, the fleet is in working order, but as with any bus fleet, issues do occassionally come up. “We were a little nervous about the levy not passing, the $1.2 million not being collected, and we know that the carry-over is going to slowly start to decline. So, we thought that since the bus fleet is in good shape and we have plenty of spares, we would just buy one this year and go back to the 2-1-2-1 [next year]. That still has us replacing half of the fleet in six years. Half of the fleet has already been replaced in the last six years,” Bishop said. He added, the stalling bus is now in Lima. The issue where it stopped on a highway, like U.S. 127, had happened in the past, he explained, and they sent the bus to get fixed, only for the issue to reappear. Now, the bus is being worked on in Lima again, where hopefully the situation will be resolved. As for the situation with black tape over safety lights, Bishop noted, “There was one bus that had a light, an Automatic Breaking System (ABS) light on. We sent it to be fixed and the repair company said they could not get the light to go off. So, it is not an emergency light that has any impact on it, but I did tell my transportation supervisor to check and if it is something that is going to keep that bus from being legally on the road, then we do not want it on the road. “I had a follow up conversation with the supervisor regarding the things that were brought up during the board meeting. I told him the concerns and told him to make sure we were addressing those. There were conversations to be had and we feel good about moving forward. “I look at it this way,” Bishop continued. “If it is a bus that has over 300,000, but it is still running and is still safe, then we are going to put it on the road. They are checked every year by the State Highway Patrol. We never put a bus out that is not given the okay. As things happen, as they do in all districts, we fix it and move on,” he said.